Poster artist Jon Sanchez was born and raised in Albuquerque, New Mexico. He considers himself an illustrator first and foremost. Although, he has utilized various art mediums for most of his life. He has been designing and screen printing posters for nearly a decade, using the name “Jonito”. These posters include traditional work, band posters, pop culture pieces and movie posters. Over the years he has created gig posters for bands such as They Might Be Giants, Edward Sharpe and the Magnetic Zeroes, Fitz and the Tantrums and The Dandy Warhols. His work also includes tour posters for Fleetwood Mac and Cursive. For special screenings in the Albuquerque cinema, his movie posters include The Crow, Bill & Ted’s Excellent Adventure, Labyrinth and Escape from New York. 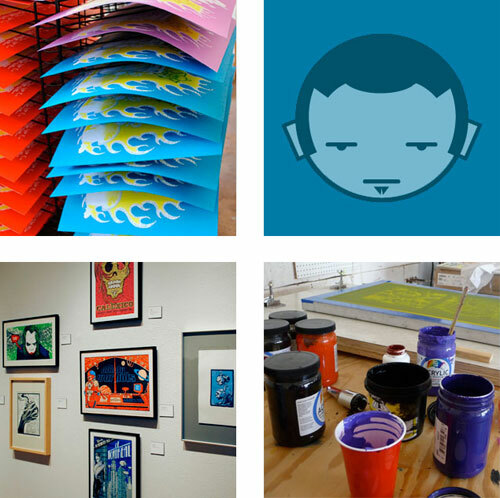 Jon creates and screen prints all of his own work in his garage studio. These posters are hand drawn, inked, digitally separated, and hand-pulled using acrylic inks. They are limited edition, have been showcased in galleries and sold nation wide. Some of Jon’s awards include the official tote design for Seattle’s Bumbershoot music festival, film awards for his production design work, and several awards in the Albuquerque art scene. Jon also showcases his work in both the Hispanic Arts Exhibition at Expo New Mexico, and Contemporary Hispanic Market in Santa Fe. Most recently, he has started creating concept illustrations for an upcoming graphic novel.